Each week, Epic releases a new set of Fortnite Challenges for its players to complete. Currently, we’re well into Season 7 of the game, with the map taking on a wintry vibe, expedition outposts and all. It’s now Season 7, Week 10 of Fortnite Challenges, and they seem to be pretty straightforward this week. In this Fortnite Week 10 Challenges Guide, we’ll list what the Week 10 Challenges are for non-Battle Pass and Battle Pass Owners. We’ll also give some advice on how to complete each one. But if instead you need help with any other areas of the game, you can head over to our full Fortnite Battle Royale guide. Here you can find not only a complete beginner’s guide to the most popular Battle royale game in the world, but also a list of essential tips and tricks that every Fortnite player should know. We’ve included a screenshot below, showing off the Fortnite Week 10 Challenges. They’re pretty simple this week, mostly involving kill-based Challenges. 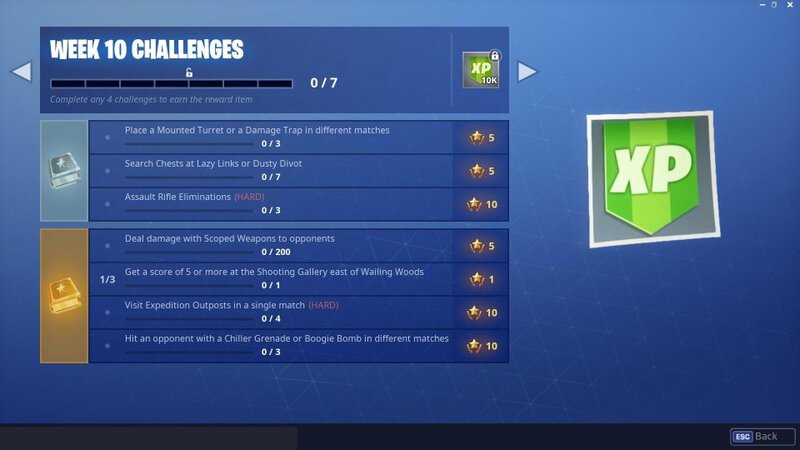 As always, there are three Challenges for all players, and then an extra three for Battle Pass users. The hardest one here is going to be finding the specific Chests at Dusty Divot and Lazy Links. For a look at where to find them, head over to our Fortnite Dusty Divot Chests Guide. Stage 2: Get a score of 5 or more at the Shooting Gallery north of Retail Row. Stage 3: Get a score of 5 or more at the Shooting Gallery east of Paradise Palms. If you need help finding all of the Expedition Outposts in Fortnite, then head on over to our Fortnite Expedition Outposts Guide. We recommend you use a plane to hit them all in a single match. And there you have it, the complete list of free and Battle Pass challenges for Week 10 of Fortnite. Now that we're all done here, you can head over to our best Fortnite weapons guide, where we rank the best weapons in the entire game.